With age, the fat pad descends and inflates the under-eye skin that causes dark shadows or in other words, black eye bags. In some cases, black eye bags are not caused by fat pad inflation but by sagging of the whole under-eye skin. 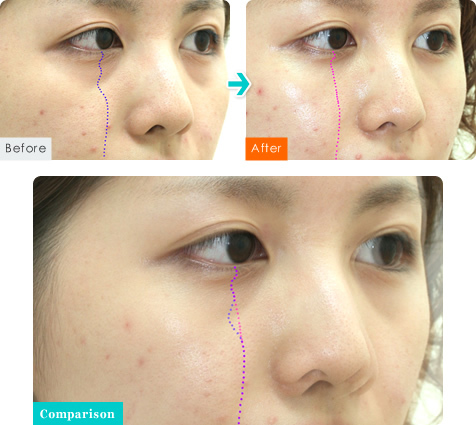 To remove this type of black eye bags, it is necessary to puff up the dents by injecting fat. At Theory Clinic, we never inject a large amount of fat at once as it may cause complications. First, we reduce the orbital fat pad by degreasing and then inject proper amount of fat to smooth any dents or sags. Under-eye skin without bags and shadows makes you look young and healthy.Black eye bags caused by dents or wrinkles under the eyes can be improved by fat injection. In general, CRF (condensed rich fat) is used for fat injection. CRF is produced from the fat collected from the patient’s body by processing it to eliminate impurities by centrifugation. To CRF, about 50cc of fat needs to be collected from the patient’s thigh or abdominal area; this causes a lot of strain to the patient. As far as the under-eye area injection, CRF's survival rate is only about 10% higher than that of the orbital fat pad. Furthermore, it is very expensive yet there is no guarantee that the collected fat can create enough CRF required for treatment. At Theory Clinic, our basic policy is to use only the collected orbital fat pad for injecting into the under-eye area. However, if the orbital fat pad is not enough, we may collect additional fat from the other parts of a patient’s body. Suture removal from the site from where the fat was collected is not necessary. You can wash your face on the same day. You can wear make-up from the next day. You can wear contact lenses on the same day. Do not rub the treated area. You can take a shower on the same day and take a bath from the next day. Since warming you body increases swelling, do not take bath for a long duration for at least a week after the treatment. Average survival rate is about 70%; however, it depends from patient to patient. Some patients have higher survival rate than the average while others have much lower survival rate. We do not inject a lot of fat in the beginning to get a higher survival rate. If the injected fat does not survive enough, then we make a clear explanation about the possibility of re-injection. From our experience, about 2% of the patients lose the injected fat to the point where re-injection becomes necessary. At Theory Clinic, fat re-injection is offered at low cost.